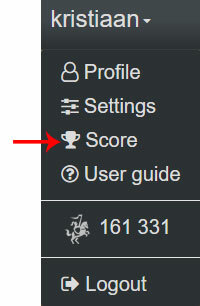 The Score page shows an overview of the trophies and points you have earned during your reading sessions. You can access the page either by clicking on your points total displayed on the dashboard (figure 1) or by selecting 'score' from the user menu (accessed by clicking on your username in the black navigation bar at the top of the page, see figure 2). Right below you can see all the trophies you have earned (figure 4). Click on the 'show trophies' button to get an overview of all possible trophies available. 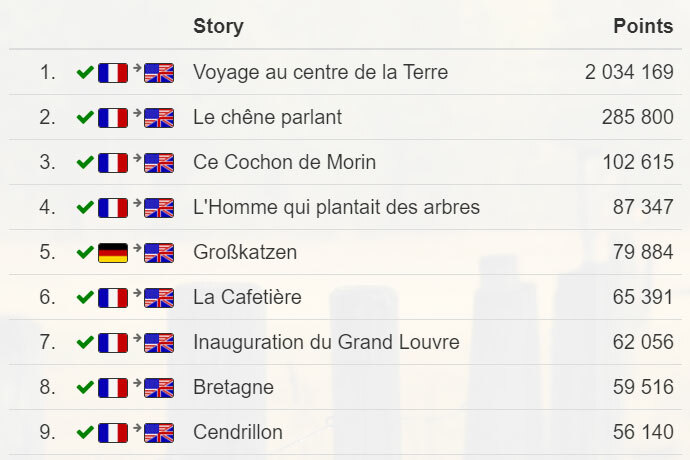 Finally you can see a breakdown of your points for each story you have started (figure 5). A checkmark indicates the story has been read at least once. If a story has been read more than once, you can see the amount of times the story was read right after the title of the story, between square brackets.